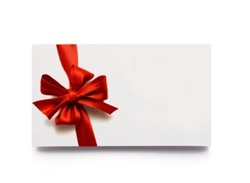 Gift certificates can be printed to be given in person, or they can be emailed directly to the recipient...your choice! Simply add a certificate to your cart, then choose "Email" or "Print" and then enter the amount and other details. If you'd like the certificate emailed to the recipient on a specific date please note in the comment field of the order, otherwise they will receive it within a few hours of the order being completed.